EDINBURG — For former football standout Steve Alaniz, the pace is much slower these days than in the 1980s. But that’s exactly how the 1985 Edinburg High and 1989 Notre Dame graduate prefers it. He’ll be recognized one more time for his career this evening when he is inducted along with the rest of the 2018 class into the RGV Sports Hall of Fame. His values remain the same as always. He is still humble and wants to stay away from the limelight. He’s proud of his time on the field but even more so of his life, family and the doors opened by his athletic ability and education. 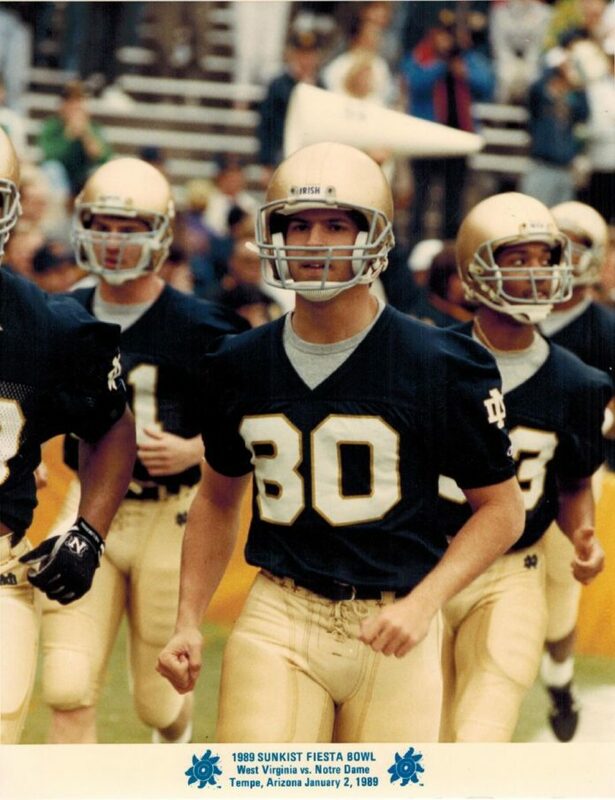 He has photos and memorabilia from his time on the 1988 Notre Dame team that earned a national title. The Edinburg High and Notre Dame grad said he was lucky to play under two coaching legends. His connection with Bobcats quarterback John Paul Cantu put the team among the state’s best during the 1984 season. Cantu was the Class 5A passing leader with 2,075 yards, while Alaniz had 68 catches to rank second in Texas. His next coach was Gerry Faust, the coach who recruited Alaniz, but Faust’s replacement Lou Holtz would be the man who led Notre Dame to the program’s 11th title. Recruiting was different in his era. Being a standout athlete helped, but that still didn’t guarantee his talent would get noticed. The days of self-promotion, recruiting portals and even showcase camps had not yet dawned. At EHS, Alaniz also lettered in basketball, golf and track and field. He feels today’s athletes should try to diversify and play different sports. His 6-foot-2-inch, 185-pound frame, in addition to his father’s connection with then-University of Texas coach Fred Akers, made Alaniz a target for educational and athletic powerhouses like Stanford, Texas and, of course, Notre Dame. After 30 years and one championship ring earned in his final collegiate game, it’s safe to say he made the right choice. The wide receiver was a cog in a powerful Notre Dame machine that ran the ball more than it passed. Alaniz said the values learned in his household, his high school and his community helped him fit into a special group.